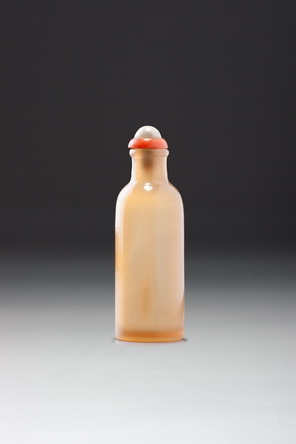 This exquisite little masterpiece is one of a small series of roughly cylindrical stone bottles. Two more were in this collection, both with the hall marks of mid-Qing princes (Sale 5, lot 77, and Treasury 2, no. 359). These princes would presumably have had access to the palace workshops or might have received gifts produced at them from the emperor. 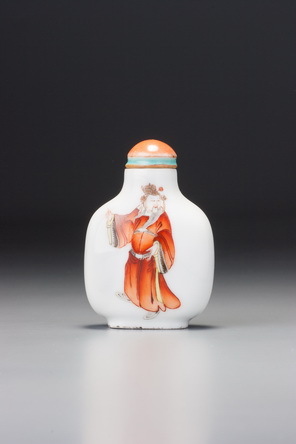 Apart from the bottles’ stunning formal integrity, hollowing, detailing, and finish, each has a small neck rim, a typical palace workshops feature on jade bottles. Although this may date from the last decade or two of the eighteenth century, the most likely date appears to be the early nineteenth century.